The above links indexes all the DIY eGPU Thunderbolt implementations which have progressed significantly by using an inexpensive native Thunderbolt2 enclosure (AKiTiO Thunder2), and reduced both the hardware and software installation compexity compared to kloper's solution posted in 2013 below. [FONT=verdana]TLDR: By buying around $250 in commonly available parts, plus a video card, you can make the graphics of your 11" Macbook Air from 5X to 7X faster. Demo video at end of post. Step-by-step, here's how to exactly do it. Warning: not for the faint of heart! NOTE: after this guide was written another was produced showing how for less than $100 more than this solution you can create a faster native 10Gbps Thunderbolt solution instead. See it at [url]http://forum.techinferno.com/diy-e-gpu-projects/4570-%5Bguide%5D-2012-13-rmbp-gtx660-sonnet-echo-express-se-%40-10gbps.html#post63754[/url]. This is my third article here on this forum, though it's the first that the process can be done by anyone with off-the-shelf parts. No more discontinued exotic parts like the $180 BPlus TH05 are required. All you need is a macbook air, a graphics card, a power supply, Windows 7, and ~$250 to buy some adapters and software online. All these parts are readily available for anyone. Like usual, I really want to thank Tech Inferno Fan for his help in doing all this. He's the mastermind behind the technicals, I just like writing articles and making stuff easier for everyone. He's super dedicated and eGPUs wouldn't be anywhere near where they are today if it wasn't for him! Thanks! The “Not supported” means that Intel won’t neither certify your product nor deliver, at the moment, any Technology License for this kind of usage. As you know, this Technology License is required to develop a Thunderbolt device in the market and Certification is a must have to market any Thunderbolt product. So with the bad news out of the way, the good news is that you can still do it yourself -- just a bit less elegantly. We'll be using the Sonnet Thunderbolt to ExpressCard adapter, together with the BPlus PE4L ExpressCard to PCI-Express adapter. This PE4L adapter also includes a Delayed PCI-Reset jumper, making Windows 7 + Internal LCD rendering possible on the Macbook. Also, it's not that bad. As you'll see by the benchmarks later in the article, yes you're only running at expresscard 5Gbps x1 2.0 PCI bus speed (as opposed to 16X 2.0 on a proper PC and only half of Thunderbolt's 10Gbps), but its WAY WAY better than the internal integrated graphics of the laptop, plus you can still max out tons of games. The full PC bus speed is super rarely used anyways, so it's not like you'll get 1/16th the performance. As part of this tutorial, we'll be using Windows 7 BIOS (installed the regular Bootcamp way). Things are possible in Windows 8 as well, but the instructions differ, and I've also had troubles getting Internal LCD rendering working on Windows 8. Yeah I'm not a fan of using legacy Windows versions either, but whatever, every game works on both OSes for now anyways. Oh and we're using Windows because games only exist for it, and I can't get the setup to work on OSX (haven't tried too much though). Sonnet Echo ExpressCard Pro. I purchased mine for $134 at B&H Photo Video. This adapter turns 10Gbps Thunderbolt to 5Gbps ExpressCard, which is needed for the PE4L later. It's probably one of the more expensive parts in your setup because of Intel's arbitrage on Thunderbolt-related parts. Note that Sonnet also sells a faster 10Gbps Thunderbolt->PCIExpress box (~US$310 Sonnet Echo Express SE) which might seem like a great idea, but that's all sorts of problems with it, including an underpowered power supply, no PCI Delay switch (making it not easily work with Windows) and dismantling it to be able to use full length and double width video cards. If you're curious, BPlus used to offer a US$180 TH05 (which included the TB cable), which was a direct Thunderbolt to PCI-Express, but Intel shut it down and the entire BPlus Thunderbolt division in Jan 2013 per TH05 Recall Notice. A Thunderbolt cable. You can get this at any Apple Store or online for around $36. I'd recommend getting a 2m cable since you'll probably want to have your GPU not directly beside your laptop. 450W power supply capable of running the video card. $24AR-shipped Diablotek PH450 offers 12V/30A (360W) or Corsair CX430 offers 12V/32A (384W) of peak power, enough for ALL current video cards. If getting a basic ATX PSU then carefully read the first rail data on it, eg: 12V1:18A means 12*18=216W of peak power. That wouldn't be enough to drive my GTX570 that can draw up to 298W peak power. Look at your video card's spec sheet to see the peak wattage only it uses (not the suggested value that often includes motherboard + hard drives, etc). Honestly though, I'd recommend going for the 450W or even 500W power supplies available for around $20 at your local money-laundering stolen-stuff electronics store. If you get a power supply that doesn't output enough or doesn't like power spikes, it'll basically make your computer blue screen a lot mid-gaming. Ask me how I know. $25 DIY eGPU Setup 1.X, developed by nando. Yes, you're paying for software, get over it. Nando did spectacular work to get Windows 7 Bootcamp to be able to properly accept the external videocard without giving an "Error 12" code. You want the latest 1.20 version incorporating new Macbook features that's not advertised on that linked page as yet. A video card. I have the NVidia GTX 570, which is an awesome balance of great performance and price. You can use basically any video card you want, including AMD ones. Note on AMD cards, internal LCD rendering won't be possible without using something like Lucidlogix Virtu (not covered in this article). Also, don't go too crazy and order a NVidia Titan. Yes it's a great card, but you won't see the value for money since you are limited to a slower PCI bus. I'd recommend sticking in the 5xx or 6xx series of NVidia GTX cards. 2013 11" Macbook Air. This is the laptop I have, but these instructions should be identical for the 13" Air. Additionally, the only step that will be different for every other kind of Macbook is the contents of the PCI.BAT file later. Post your laptop's specs in the comments of this thread to see if someone has a PCI.BAT for you. A USB memory key that's at least 4GB for Bootcamp to install windows plus it's drivers. Other software: Windows 7 ISO (from MSDN / MSDNAA / etc). Don't steal software. Still with Boot Camp Assistant, partition your main drive and start the Windows 7 installation process. I recommend around at least a 60GB partition. Games are big these days. If you just don't have the space, you can do what I do and turn off Hibernation Mode and the Virtual Memory Page File to save hard drive space (about 17GB together). Disabling Virtual Memory is kind of a bad idea, but I've never had troubles doing it -- this laptop's 8GB of ram is usually enough for anything. Once partitioning is done, your computer will auto reboot and the Windows 7 installer will start. Install Windows 7. The Windows 7 installer will install the Boot Camp drivers at the end of it. Go to Intel's site and download the latest Intel HD 5000 drivers for Windows 7 64-bit. It's the same download for the HD 4000 drivers. Launch Windows Update and apply all required/optional patches. Reboot as required. Repeat this step until nothing’s left. This will take a long time, deal with it. On the PE4L, set SW1 (on the right) to position 3 (6.9s, though note it's more like 30s). Set SW2 (on the left) to position 2-3 for 2X (even though only 1X is really supported thanks to Intel requiring us to use the Sonnet Expresscard adapter). Plug in the power (the white connector) into the PE4L from your power supply's floppy disk drive connector. There is no need to plug in the Black and Red cable (this is for automatic powersupply control, which doesnt work on the Macbook). Keep the jumper on both pins on the bottom right of the board. Plug in the motherboard connector to the included SWEX adapter. Make sure it is in the ON position (1-2). Also plug in any required 6-pin/8-pin connectors to your GPU. Mine required 2 6-pin plugs. Plug in the PE4L to your video card. It obviously won't cover all the pins of your video card, that's ok. Yes, I know it looks ghetto. 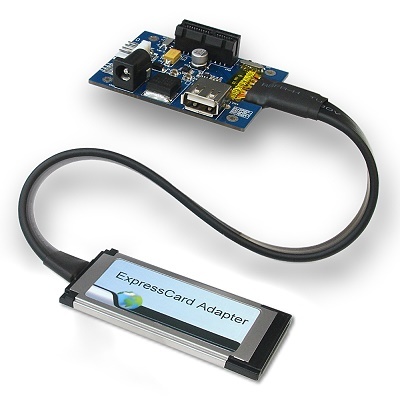 Plug the express card end of the PE4L into the Sonnet ExpressCard Pro. Make sure your laptop is shut down. Plug in the thunderbolt cable to the Sonnet and then the laptop. Also, make sure no monitors are plugged into the video card. Turn on the power to the power supply, the GPUs fans should start, then start your laptop. Hold the Option key. Now wait for the red light to turn off on the PE4L. Once it’s off, select Windows. Go to NVIDIA’s site, download and install the latest drivers for your video card. When prompted to reboot, shut down the computer instead. Turn off the eGPU’s power supply. Start the eGPU's power supply again and boot your laptop, waiting for that red light to go off again before selecting your Windows partition. You will always need to do a power cycle of the eGPU when rebooting your computer because of the way the PE4L works. Once Windows has started, open the Device Manager. Select Scan For New Hardware. Notice the GTX 570 (or whatever card you have) is listed with the yellow exclamation mark. If you double click on it you’ll see the dreaded Error 12. This Error 12 means that Windows wasn’t able to allocate a contiguous block of memory for the video card. Yes you probably have 8GB in your laptop, but the PCI Bus doesn’t work that way. We’re going to get rid of that error by reallocating devices in the PCI Bus. Go purchase DIY eGPU Setup 1.x (link above) if you haven't done so already. Run the self-extracting exe when booted into Windows to install to c:eGPU. Open an administrator command line and run c:eGPUsetup-disk-image.bat. This will install everything and add a boot item so you can load the video card. Next we'll configure DIY eGPU Setup to work with the 2013 Macbook Air and Haswell chipset. Mount the virtual disk image by running e:eGPUeGPU-Setup-mount.bat in Administrator mode. This will mount a V: drive. In notepad, create the file V:configpci.bat and paste the following into it. Note that this is the file that changes depending on your Macbook type. If you dont have a 2013 Macbook Air, a couple addresses might change. Post in this thread and hopefully someone will post your config. :: to be altered depending on what TB enclosure/adapter you use. Turn off your MacBook, power cycle the eGPU from the power supply and make sure the thunderbolt cable is still plugged into the MacBook. Make sure no display is plugged into the card. Turn your MacBook on while holding Option. There's no need to wait for the red light to turn off now before proceeding. Select the windows partition. Windows will boot into a menu allowing you to select between Windows and eGPU setup. Select eGPU setup. Once that exits, you'll be back at that same boot menu. This time select Windows 7 and wait for it to boot. Open up the Device Manager and you should see the GTX 570 again, except ... without the yellow exclamation mark! Horray! You fixed Error 12! This is basically whats been preventing people for a while from getting eGPUs working on their laptops. Double click on the NVidia icon in the system tray. On the left side click on “Adjust image settings with preview”. I know it’s shocking, but if you see a spinning NVidia logo, your internal LCD screen is being rendered by your external GPU! If you don’t believe me, launch your favorite game and notice how there’s no way the Intel HD 5000 could render it so well. I recommend you now install your fav benchmarking software, GPU-Z, FRAPS, Steam, etc to take advantage of your laptop’s new abilities. Again, for AMD cards to render on the Internal LCD, you’ll need to use Virtu. See [URL]http://forum.techinferno.com/diy-e-gpu-projects/2967-lucidlogix-virtu-internal-lcd-mode-amd-egpus.html#post41056]Lucidlogix Virtu : internal LCD mode for AMD eGPUs[/URL] for instructions on how to get this to work. When doing Internal LCD mode (which you’re doing when you have no monitor plugged into the video card), PhysX might not be on. Open the NVidia control panel and switch it from CPU to Auto. When doing benchmarks, keep it on CPU though. If someone knows how to get the eGPU to restart with a reboot of the computer, please let me know. Simply connecting the black and red cable isn't enough on the MBP from my observations. I tried the switch in both positions and both polarities. All games were run at 1366x768. Internal and external monitor were set to this. VSync off everywhere. The Macbook Air 11" has this resolution on the LCD. Sorry that this kinda makes the numbers seem high for real-world-with-a-monitor gaming. "Min settings" means that I set every setting to the lowest possible value. This should make the game run as fast as possible (but look ugly). "Max settings" is the opposite. If the game had the option for presets of "Very Low" and "Ultra", etc, I just selected those and didnt go into advanced modes (except to turn off VSync). Bioshock Infinite Internal LCD numbers arent ready yet. A decision you'll need to make is if you want to plug a monitor into your video card or just use your laptop's monitor. Each has it's own pros and cons. You'll get faster performance with an external monitor, but you'll lose the convenience of not needing a giant monitor. This becomes relevant as people make better eGPU cases where your eGPU will be portable. Why bring a monitor to your friend's place when your laptop already has one? It's actually kind of cool that you even get this choice. The way it works is by the NVidia Optimus drivers taking the video frame memory from the video card, piping it back over the Thunderbolt bridge to the Intel HD 5000 memory and overwriting Intel's memory so that you see the eGPU's output on the Intel LCD. Cool! If you're curious, this is the exact tech that's used when laptops have an NVidia internal discreet graphics chip. It has become very clear that gaming is not only high-performance, but super practical on an 11" Macbook Air. There's so much going against it: this hodgepodge of adapters, it has a low voltage CPU, disaster of wiring and exposed sensitive parts, crazy boot-time chainloading software, Intel killing companies producing adapters and products left right and center via legal threats, etc. but somehow, with the right parts and some patience, it works spectacularly. And is quite cheap too! Again I want to thank Tech Inferno Fan for all his help in working with me tirelessly over the last few months to get this working. Also, thanks goes out to TechInferno and the community thats been built here for allowing people to help eachother so efficiently. If you have any questions/comments, please feel free to reply to this thread. I'm also available on twitter, @lg. * [url]http://forum.techinferno.com/diy-e-gpu-projects/4570-%5Bguide%5D-2012-13-rmbp-gtx660-sonnet-echo-express-se-%40-10gbps.html#post63754[/url] - an alternative guide put together after this one showing a native 10Gbps Thunderbolt solution for < $100 more. * [GUIDE] 2012 13" MBP + GTX660Ti/HD7870@x2.2 (TH05): nando's extensive performance comparison of x1 2.0 (TB-to-EC) versus x2 2.0 (native TB) bandwidth, AMD vs NVidia, and NVidia Optimus vs LucidLogix Virtu drivers for internal LCD mode. * Thunderbolt, expresscard and mPCIe eGPU implementations: documented DIY TB/expresscard/mPCIe eGPU implementations. I'm seeing comments at macrumors about Thunderbolt's bandwidth limitations. The electrical link to the pci-e device is x4 2.0 (16Gbps) but Thunderbolt is restricted downstream to 10Gbps, 12.5% slightly faster than x2 2.0 as discussed. Need to wait for 'Thunderbolt 2' with 2014 ETA to see them uprate that to 20Gbps. 'Thunderbolt 2' will be slightly faster than x4 2.0 performance, giving over 90% of real-world desktop PC performance. Native 10Gbps Thunderbolt enclosure instead of using 5Gbps expresscard? Kloper is using a Sonnet Echo Expresscard Pro Thunderbolt-to-expresscard adapter to connect a PE4L 2.1b (expresscard) to his MBA's TB port. That adapter downgrades bandwidth from Thunderbolt's native 10Gbps to Expresscard 2.0's 5Gbps. OWC Helios and Sonnet Echo Express SE are alternative native 10Gbps TB solutions starting at a costlier $310. Though they have two additional problems. First is they'd need to remove the circuit board and run it without the case since it's restricted to single-width cards unless you want to pay US$799(!!) for a Sonnet Echo Express Pro that can host a double-width card. Second is they are missing the PCI Reset Delay circuit necessary for BIOS/MBR boot (bootcamped Win7/Win8) to work. T|I user strandmatte was able to overcome both these issues and present a faster 10Gbps native Thunderbolt solution costing less than $100 more than klopers expresscard-to-thunderbolt one. See strandmatte's guide at http://forum.techinferno.com/diy-e-g...html#post63754 . It's worth mentioning that a US$180 BPlus TH05 (inc Thunderbolt cable) native Thunderbolt adapter released in Sep 2012 had none of the issues the Sonnet Echo Express SE or OWC Helios has but was recalled in Jan 2013 due to (presumably) threats by Intel/Apple per TH05 recall notice. Prior to the recall, several users had successfully implementing eGPUs using the TH05 as shown below. These were simpler, cheaper and had double the pci-e bandwidth of kloper's expresscard (5Gbps) solution. What performance benefit does x2 2.0 give over x1 2.0? Users with IVB/SB expresscard/mPCIe eGPU implementations would likely want to know how much better performance would a Thunderbolt eGPU provide. are not taxing the pci-e bus. The extra bandwidth required when running internal LCD mode where both Optimus and Virtu benefit significantly from the increased bandwidth. SimoxTav has produced the most comprehensive set of youtube game videos showing x1.2Opt internal LCD performance. x1.2Opt designates that a x1 link and iGPU was detected after which the NVidia Optimus driver engages pci-e compression greatly accelerating mostly DX9 titles (30-300%). That's using a 12.5" HP 2560P + GTX560 with the 1366x768 LCD resolution and 5Gbps pci-e bandwidth as kloper's 11" MBA above. SimoxTa's summary of performance seen. notebookreview.com host linked via webarchive as they've been a saboteur of this project. boon111 has youtube gaming videso showing x2 2.0 internal LCD performance. That's using a 2012 13" rMBP i7-3520M 2.9 + GTX670 with a native 10Gbps TH05 Thunderbolt adapter. Full configuration details at TH05 eGPU Setup 13" Retina Macbook Pro Late 2012.
boon111's channel - Youtube: Black Ops 2, Crysis 2, Starcraft 2, Diablo 3, Dirt 3, Borderlands2, Batman Arkham City. The affordable gamechanger may come if Silverstone T004 is released in the coming month or two. US$250 for a 450W double-width, full length and width native 10Gbps Thunderbolt eGPU enclosure. No messy wiring, well priced and looks great. Awesome. Will only be available for purchase if they pass Intel certification. Am curious if Intel will continue to be a fun-wrecker and block it or finally concede. Intel have not exactly been generous in giving users pluggable bandwidth for their notebooks. Had they been more cooperative we would have seen mainstream eGPUs over 4 years go. Instead Intel obstructed the possibility by locking down features like user-settable x2/x4 southbridge ports (starting Series-6) preventing ganging mPCIe/expresscard slots to extract multi-lane bandwidth. Intel's oppositional conduct disorder means it's listed as a saboteur of this project. What if Intel/Apple continue to refuse to support eGPUs over Thunderbolt? Then we'll continue to see more hacks via mPCIe slots such as MikJoa's workaround below. There Sony never bothered to allow an external desktop video card via it's proprietary 10Gbps Lightpeak port. So MikJoa completely ignored the LP port instead cutting a hole in his 13" Sony Z3 (awesome machine!) and wiring up an eGPU using the x1 2.0 (5Gbps) mPCIe wifi slot as shown below. End result is the same 5Gbps + pci-e compression bandwidth as kloper achieved but without any need for Thunderbolt accessories - it's all just straight pci-e 2.0, so is $134 cheaper than kloper's TB-to-expresscard solution. If Intel enabled pci-e 3.0 on their Southbridge ports then it would be x1 3.0, nearly the same bandwidth as 2011-2013 Thunderbolt. @kloper thanks for the very detailed guide. Sorry about the temporary downtime everyone, we didn't expect such a large influx of guests all at once. Server has been upgraded to handle the increased traffic. The affordable gamechanger may come if Silverstone T004 is released as they say in the coming month or two. $250 for a 450W double-width, full length Thunderbolt eGPU enclosure. Awesome. Very exciting to see this. But if Intel, as stated in the first post, will not give a license to a Thunderbolt device aimed for external GPU usage, then how can SilverStone ever release this product? Ok, I saw you edited your post. Let's hope Intel will stop their nonsense, they are getting bad reputation. Would be rather pointless of SilverStone to even start work on this just to get rejected. First of all, you must have big balls (and a big wallet) to try something like this. I have a couple of questions about the performance if you find the time to show a bit more. I've seen companies like MSI, Silvertone, and others build prototype external GPUs for Thunderbolt over the past couple years that only worked with Windows as well but none of them had benchmarks like yours listed. Do you have any other GPUs form different generations you could try? I am curious to know what the cap on performance would be. Like, would a GTX460 (or whatever older card) get the same or worse numbers as the 570 you have. Could you post a video of game play footage when in an intense battle? More baddies the better. Let's see this thing under a heavy load. What's the frame rate then. (No offence, but shaking the mouse around in a friendly city is hardly stressing the card). Just want to know what the cap is/might be on this kind of rig. I mean, your 570 is plug into a port that's a fraction of the speed NVIDIA says is it should need for it's "peak bandwidth" of 160 Gbit/s. Basically, I just want to see this thing catch fire lol! No, but I would like to see a big battle of some kind. StarCraft 2 would be a good one, having to render all of those little units live in some of the custom tug of war games are stressful on the system. Anyway, thanks for humoring me. SimoxTa has produced the most comprehensive set of youtube game videos showing x1.2Opt internal LCD performance. That's using a 12.5" HP 2560P + GTX560 with the 1366x768 LCD resolution and 5Gbps pci-e bandwidth as kloper's 11" MBA above. This is AWESOME! I have been waiting for this solution to come for so long! I will definitely try this out over the weekend! However I have a question regarding OSX. Many of us use OSX for video editing, and if I were able to use this method to boost my graphics card on OSX that would make my life complete. Currently my macbook retina's 13" graphics is a bit too slacky and slow for what I do in terms of editing. Do you think it would be possible to make this work for video editing on OSX any time soon? It seems like we will have to wait until Apple makes graphics card compatible with thunderbolt and it's OS. If you use an older macbook pro with expresscard, a non-thunderbolt egpu is virtually plug and play with OS X. Hey there! Congratulations on what you did there and thanks for the very detailed guide, I pretend to follow it with my laptop and later post my results. However, I'm a MacBook Pro 13'' Core i7 Mid 2012 owner, so I guess I need a different pci.bat file. Does anyone here have the .bat file I need for my laptop? I'd be eternally thankful if so. On the other hand, I'm not quite sure about the portability I'd get from the moment I install the eGPU and so on. What are the steps to follow, for example, if I have to use windows later not in my home? Or if I just want to take my laptop anywhere else? http://forum.techinferno.com/diy-e-gpu-projects/3062-2012-13-mbp-gtx660ti-hd7870-th05-%40-x2-2-0-a.html#post42483 has details you require along with a pci.bat. eGPU is disconnected using the "Safely remove hardware" system tray item. I'm a bit confused. I've gathered all the hardware components I need to make this happen. I have a mid-2012 MBA 11" i7 8GB, PE4L, sonnet echo and a gtx 660. However I'm not sure which path I should choose regarding BIOS or EFI for my windows installation. Some information suggests EFI is the better route. Then I read this thread. Anyone more enlightened than me care to share more info? If EFI works then it can eliminate the need for pre-booting via Setup 1.x giving a plug and plug solution. Certainly that was the case for my 2012 13" cMBP in my sig. However, both kloper and google_peace, both 2013 and 2012 MBA owners respectively, chose BIOS mode. I recall the reason being the iGPU not working properly if boot with the eGPU active in EFI mode. Google_peace's implementation is at http://forum.techinferno.com/diy-e-gpu-projects/2735-macbook-air-2012-8gb-th05-560ti-egpu-setup-1-x.html . :: adapter these are 7:3.0. So replace '7:3.0' entries below with '7:0.0' if using native TB enclosure. echo Performing PCI allocation for 2012 MBA (BIOS) based on Tech Inferno Fan analysis . . . Thanks a lot for the info! Much appreciated! I'm nearly complete on my setup. I will contribute my own personal rig thread in the e-gpu forums once I compile everything. Side question. Looks like Pierre is running a TB hub with a SATA drive. Any idea how he is pulling that off? Do you know if the eGPU takes a performance hit from doing such? Would be really nice to have a dedicated external Windows7 drive! Further inspection Pierre is directly hooked into the echo. However would there be a bandwidth drop thus performance hit. 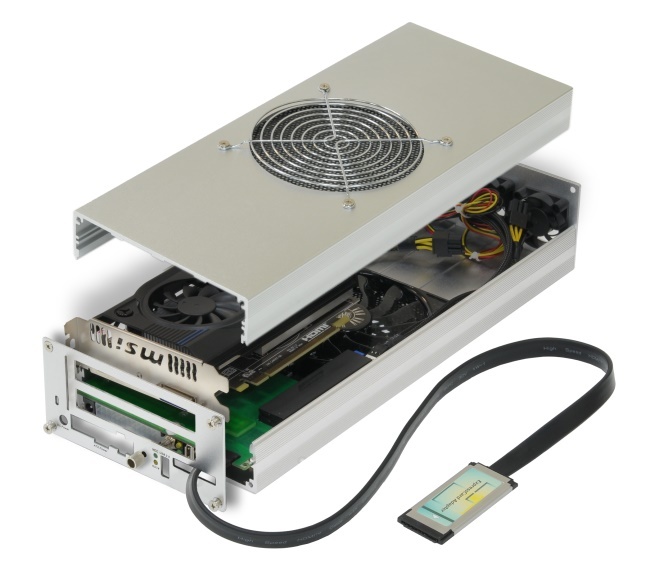 If you placed chained a thunderbolt external drive in with a e-gpu? Just curious. This is an interesting scenario. In a native Thunderbolt configuration there would be a performance drop in a daisy-chained configuration as the 10Gbps pci-e pipe would be shared between video and data. You however are using a Sonnet Expresscard TB-to-expresscard adapter. There it uses slightly less than 5Gbps of the available bandwidth. Meaning there is still another 5Gbps that's untapped. Unless your external TB enclosure is running RAID, individual SATA-II/SATA-III drives would be limited to 3/6Gbps bandwidth. Meaning they'd be using the other half of available bandwidth under full sequential transfer loads with little if any affect on your eGPU performance. "I've gone through all the steps. Added the mba 2012 pci.bat file that Tech Inferno Fan kindly provided. But I'm still seeing the error 12? Not sure what is wrong here?" Nevermind I fat fingered my startup file! Doh. Everything works 100%! Thank you! Is this possible with MBA 13.3" 2012 Model (4GB Ram, 128 SSD) ?? Obviously you're a bit limited on RAM and disk space but sure it is possible with that model. Hi I found your project very interesting and I would like to buy everything to make a similar device. you mentioned that for a Macbook Air 2013 (bought on August 24th) it is the same configuration and the same process isn't it ? - First, (Maybe a stupid question but did not see anyone writing about it) Can I connect an external screen to be able to use games on a much bigger screen than the macbook air 13" if yes is it worthy ? - Second, what do I need to change to configure the e-gpu on a macbook air 13" mid-2012 ? - First, (Maybe a stupid question but did not see anyone writing about it) Can I connect an external screen to be able to use games on a much bigger screen than the macbook air 13" if yes is it worthy ? - Second, what do I need to change to configure the e-gpu on a macbook air 13" mid-2012 ? Yes, an external LCD works. It is most definitely "worthy" as performance is better using an external LCD than using the internal one. The internal one sees an average 19% performance degradation as a result of using some of the narrow TB/expresscard bandwidth for the internal LCD image data. 2.Create the following files using notepad. echo Performing PCI allocation for 2012 MBA (BIOS) based of Tech Inferno Fan analysis . . .
3. Reboot your system into Windows mode (hit Option key if not default). At the initial Win7/8 bootmenu, select DIY eGPU Setup 1.20, then "automated startup via startup.bat". It will do it's magic and then you'll see the Win7/8 bootmenu again. This time select Win7/8 to bootup with the eGPU configured. Step (3) will now need to be applied whenever you want to use the eGPU in Win7/8. Now that I am using much faster GPU (gtx 680) v/s that of Kloper's (gtx 570), the benchmarking results are confusing. For 3D mark 6 - I have 16843 v/s kloper's 19921 - which is wrong/something missing!? Now, I understand that the overall result is based on both CPU + GPU, and Kloper have a faster CPU (i7) compared to mine (i5), but if you see the result of the graphics along (in detailed scrores) you will see that my graphics FPS is < Kloper's (for 3D mark 6 only). What is going on here? Since the score is > 15k I am confident that both of us have optimus compression working. Also, my eGPU is working @ PCIe Gen 2 @ x1 link. Can you please assist if I am missing something?? That and of course Kloper's CPU is quite a bit faster (3111 vs 3591). I wouldn't be overly concerned though if you are then consider loading Win7 instead of Win8.1. You are definitely getting x1.2Opt performance and the resolution run of 1280x1024 means that both tests were on external monitors. I have an early-2011 Macbook Pro that has Thunderbolt 10 Gbps. This external graphic card idea is awesome, I wanna try it! Can you provide me the pci.bat startup.bat configs for this MBP model? Also, can this PCIe adapter work for all nvidia models, even the new ones (with PCI 3.0) ?